For the past year, Google searches for “Customer Data Platform” have been steadily rising and the market for them has been quietly and quickly ballooning signifying the new frontier of marketing - the customer data platform. 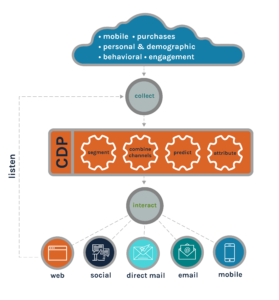 Undoubtedly, marketers are researching customer data platforms (CDPs) to gain a better understanding of what this technology is and how their organization can benefit from a CDP. According to David Raab, a technology analyst and founder of the CDP Institute, a customer data platform is “a marketer-managed system that creates a persistent, unified customer database that is accessible to other systems.” This means that a true CDP can be used by marketing with little IT help, and be able to target customers on a more granular, one-to-one level, across multiple devices, with ease. It’s true that nearly ever marketing vendor touts that they provide a ‘360-degree” or “centralized” view of the customer, but that assumes you already have a unified and integrated storage system of all your customer data to feed into it. A CDP differs from customer relationship databases (CRM) and data management platforms (DMP) because they’re designed specifically to be a central location for all customer data, both online and offline, that marketers can manage and use. A CDP can pull in data from sources across your business: web, email, in-store, POS, call centers, catalog, etc… And by having all of this data in a single storage place, marketers can gain deeper insight into their customers and drive increasingly targeted campaigns. To put it another way, a CDP makes data actionable. For many marketers, one of the few things more overwhelming than the sheer volume of data is the number of technologies they’re attempting to understand, integrate, use and measure. For these marketers, the idea of purchasing another technology platform, regardless of how “trendy” or valuable it would be, seems daunting. At QuickPivot, we help businesses develop customer data solutions, which may sometimes involve implementing new technology, or it could just involve consolidating data sources into existing technology. Each solution is different based on the company’s goals, existing technology, and available resources. What excites us most about CDPs is that we finally have a name and a definition for a capability that we’ve had for years. By using our technology with the insights and support of our marketing services team, our customers are able to seamlessly consolidate all of the customer data, gain deeper insights and create advanced targeted segmentations for personalization. One of our clients, a global technology leader, came to us a few years ago because they lacked a globally integrated system and strategy for campaign and lead management. QuickPivot built them a CDP (even if we didn’t call it that at the time!) that integrated with their lead management and other contact databases. Our services team helped them to define and implement businesses rules to clean, validate, standardize and append their data. With this new system, they were able to run more than 400 personalized campaigns per quarter, reduce processing cost per lead from $1.10 to $.08 and increase lead-to-opportunity conversions by 400%. Whether you’re just looking to consolidate your customer data or you’re looking for a fully integrated marketing suite with customer data at its core, QuickPivot can help you. Interested in learning more about our solutions? Setup time for a conversation today!